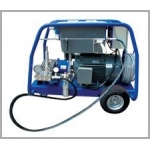 The Morclean Sitemaster range of Ultra High Pressure Water Blasters (electric and engine driven) are heavy duty, high performance machines designed for the professional, industrial user. 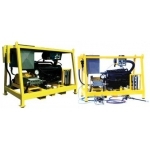 They are ideal for use in robust environments such as off shore, shipping, marine, building and construction, automotive, manufacturing, oil and gas and power plants. This new range is designed not only to clean surfaces but also to blast off scale, grime, rust and graffiti as well as roughening and even cutting through concrete surfaces. 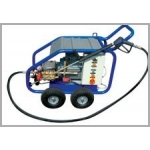 The water jetter machines will also remove algae off concrete constructions, paint, graffiti and rust off steel and concrete surfaces, dust, dirt, soil and mud off floors, oil & grease off engines and mechanical parts, dirt and salt deposits off ship decks, lime scale deposits and marine growth and cleaning construction machinery, equipment and scaffolding. Morclean Ultra High Pressure Jetters provide the solution. The EcoTherm is a new edition to Morclean’s UHP hot water jetters. 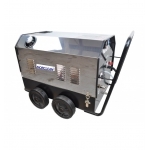 The trailer mounted unit is extremely powerful, available in either 600 bar or 800 bar pressure. The machine cleans highly effectively heating up hot water from its own twin boiler system reaching temperatures of up to 95 degrees centigrade. 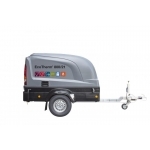 Built on a sturdy single axle trailer it can be towed by most vehicles and common driving licences. 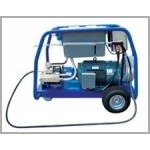 Its compact lightweight construction makes it easily portable, featuring integral fuel and water tanks and lance and hose storage.